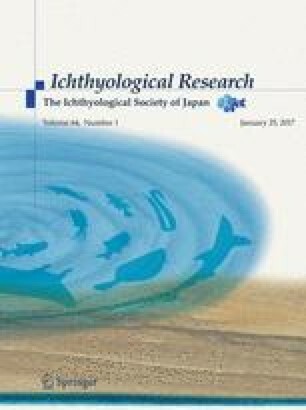 To investigate the early life history of Seriola dumerili, we first validated otolith daily increments using reared fish (11–51 days after hatching). Four larval and early-juvenile S. dumerili were collected in May and July 2015 around the Penghu Islands, Taiwan (23.45–23.70 °N, 119.40–119.70 °E), by surface larval net towing, but not from drifting seaweeds. Seriola dumerili were caught at the thermal front, and the total lengths and ages ranged 7.4–42.5 mm and 18–56 days, respectively. Our results indicate that the hatching dates of S. dumerili were April to June and larvae may have been accumulated in the frontal zone before the juvenile phase. The authors wish to thank the captain and crew of the R/V Fishery Researcher 1, Fishery Researcher 2 and Hai-an, and the staffs of Penghu Marine Biology Research Center, Fishery Research Institute, Council of Agriculture, Taiwan, for their help during the research cruises. We also express our gratitude to the two anonymous reviewers for their constructive comments. This study was financially supported by Grants-in-Aid for Scientific Research, JSPS, Japan to Y.S. (16H05794) and R.K. (16H05795), Sustainable Aquatic Food and Environment Project in the East China Sea, MEXT, Japan to Y.S. and R.K., Research Initiative for Adaptation to Future Climate Change, Nagasaki University to Y.S., and JSPS Bilateral Joint Research Projects with Taiwan (Open Partnership) to R.K.